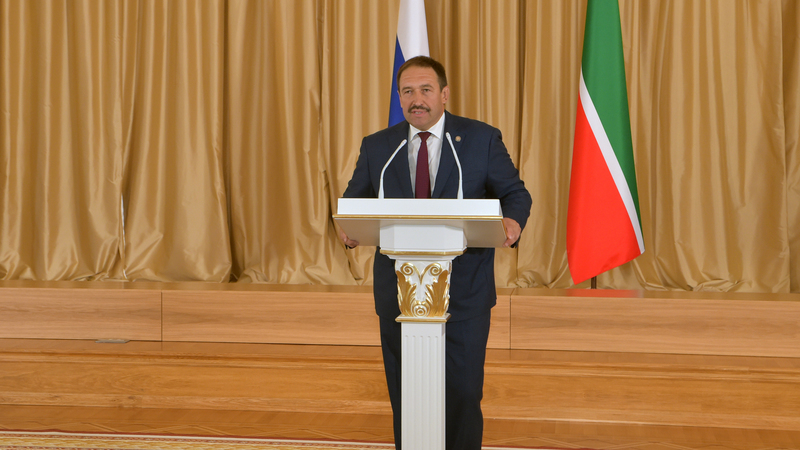 On July 27, in the Kazan Kremlin, Acting Tatarstan President Aleksey Pesoshin handed in state awards of Russia and Tatarstan to the workers of various industrial and agricultural enterprises, representatives of the educational sphere, medical communities and transport, culture and arts figures, as well as representatives of state and municipal authorities. “I want to thank you for your diligent work and your devotion. Your daily work for the benefit of Tatarstan makes a great contribution to improving standards of living in the country and its social and economic development,” Pesoshin welcomed the audience. Tatarstan still remains the leading region of the Russian Federation on main macroeconomic indicators. In terms of gross regional product the republic ranks seventh among Russian regions, in the volume of investments in fixed assets, in industrial production and construction it takes the fifth place, in agriculture – the third place and in retail trade turnover it ranks the eighth. The authorities continue the work on establishing zones of advanced economic growth based on cluster approach, in order to enhance competitiveness of the republic. Kazan is becoming the centre of major international events from year to year, he said. “Guests, visiting the republic during the international events, will forever remember the cultural feature and hospitality of Tatarstan,” Pesoshin added. “Dear friends! Your talent, diligence, persistence make our republic and country strong and prosperous. I wish you happiness, health, well-being and confidence in the future. I sincerely congratulate you on the high awards,” Acting Tatarstan President addressed the audience. As many as 43 people became laureates at the ceremony of handing in state awards of Russia and Tatarstan.